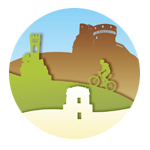 In the 2019 edition, Romagna Bike Trail will have two routes to allow people to plan at best their trail accordingly their time and physical condition. The route presents different types of road surface: participants will face tarmac, dirt roads, cycle lanes, forest paths. N.B: The route will also cross some nature reserves and areas reserved for pasture, often enclosed by fencing. Consequently, the athletes will encounter gates to these areas which the organizers highly recommend should be closed after use. Bologna, Forli’, Rimini and Venice airports run main line and charter services among the major Italian and European cities. From each one of these airports you can rent a car (see how to reach Ravenna by car) or go to the railway station (by bus) and take a train to Ravenna. Motorway (in Italian Autostrada) A14; about 6 km after Imola exit, follow the deviation to Ravenna. Motorway (in Italian Autostrada) A14. Leave the motorway at Cesena Nord and take the “Superstrada” E45. State road SS 309 Romea.